Clyfford Still, Fear (PHX-13), 1945. Oil paint on paper; 32 x 25- 3/4 inches. Private collection. Courtesy of the Clyfford Still Museum © City and County of Denver / ARS, NY. Mark Bradford, Realness, 2016. Mixed media on canvas; 108-1/4 x 168-1/2 in. Denver Art Museum Collection: Purchased with funds from anonymous donors; funds from Vicki and Kent Logan by exchange; Baryn, Daniel and Jonathan Futa; Craig Ponzio; Ralph L. and Florence R. Burgess Trust; DAM Contemporaries; Volunteer Endowment Fund; Suzanne Farver and Clint Van Zee; Andrea and William Hankinson; Amy Harmon; Arlene and Barry Hirschfeld; Lu and Chris Law; Sharon and J. Landis Martin; Tina Patterson and Bill Cottingham; Amanda J. Precourt; Judy and Ken Robins; Annalee and Wagner Schorr; Ellen and Morris Susman; Tina Walls; and Margaret and Glen Wood. © Mark Bradford. PH-929 will be on view at the Clyfford Still Museum during this collaborative two-venue exhibition. Mark Bradford, Butch Queen, 2016. Mixed media on canvas; 104-1/4 x 144-1/2 inches. Collection Albright-Knox Art Gallery, Buffalo, New York, George B. and Jenny R. Mathews Fund, by exchange, 2016. ©Mark Bradford. Photograph by Joshua White. Mark Bradford, Shade, 2016. Mixed media on canvas; 60 x 48 in. Courtesy the artist and Hauser & Wirth, Inc. ©Mark Bradford. Photograph by Joshua White. Mark Bradford, Mississippi Gottdam, 2007. Billboard paper, photomechanical reproductions, acrylic gel medium, comic-book paper, wrapping paper and additional mixed media on canvas; support: 102 x 144 in. Collection Albright-Knox Art Gallery, Buffalo, New York, George B. and Jenny R. Mathews Fund, 2008. ©2007 Mark Bradford. Image courtesy of the artist and Sikkema Jenkins & Co., New York. Photograph by Luciano Fileti. Mark Bradford © Courtesy the artist and Hauser & Wirth. Contemporary works and abstract expressionist masterpieces converge in Shade: Clyfford Still/Mark Bradford, a collaborative two-venue presentation by the Denver Art Museum (DAM) and Clyfford Still Museum (CSM). 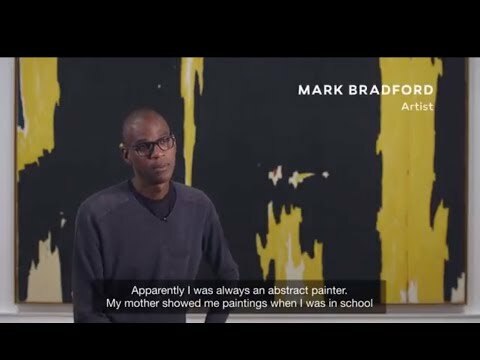 Paintings by renowned contemporary American artist Mark Bradford—who is representing the U.S. at the 2017 Venice Biennale—are on view at the DAM, alongside related canvases by Clyfford Still. An exhibition of Still's work curated by Bradford is on view at CSM. Shade underscores the legacy of abstract expressionism and Bradford's exploration of abstraction's power to address social and political concerns. As an African American painter, Bradford has long been fascinated by Still's extensive use of black as a signature component of his work. Shade explores both artists' unique relationships to black in their paintings, whether it's used to force viewers out of their comfort zones, evoke emotions, or confront conventional notions of race. Social activism through art will be explored further with programming at both museums, inspired by Bradford’s Art + Practice Foundation, which he founded with philanthropist and collector Eileen Harris Norton, and social activist Allan DiCastro. Shade is accompanied by an illustrated exhibition catalog that is available in The Shops at the Denver Art Museum and online. This is a traveling exhibition, a version of which was on view at Buffalo’s Albright-Knox Art Gallery May 26–October 2, 2016, and will be on view to Denver audiences April 9–July 16, 2017 at DAM and CSM. DAM’s exhibition, curated by Rebecca Hart, curator of modern and contemporary art, will be an expanded presentation of the works on view at Albright-Knox. Bradford’s curation at CSM will feature approximately 15 works by Clyfford Still, and continues the Artists Select program, which invites contemporary artists to curate works from the museum’s holdings to explore Still’s legacy and the inspiration each draws from the work. DAM members can see Shade for free through July 16 (included in general admission). Your DAM membership card or general admission receipt also grants entry to the Clyfford Still Museum during the run of this exhibition. Shade is a collaborative, two-venue exhibition with the Clyfford Still Museum (CSM). Admission at both venues is included in the price of general admission, which can be purchased online for nonmember adults; tickets are free for members and youth under 18. Your general admission receipt will allow you to visit the presentation at the DAM and at CSM during the run of this exhibition. Shade: Clyfford Still/Mark Bradford is organized by the Albright-Knox Art Gallery. Its presentation in Denver is a collaboration between the Albright-Knox Art Gallery, the Clyfford Still Museum, and the Denver Art Museum. This exhibition has been made possible through the generosity of First Niagara Foundation, Mr. and Mrs. Charles W. Banta, Jay Goldman, Hauser & Wirth, Deborah Ronnen, and Amy and Harris Schwalb. The presentation at the Denver Art Museum and the Clyfford Still Museum is generously funded by Vicki and Kent Logan, Christie’s, and U.S. Bank. Additional funding is provided by the donors to the Annual Fund Leadership Campaign, and the citizens who support the Scientific and Cultural Facilities District (SCFD). Promotional support is provided by 5280 Magazine, CBS4, Comcast Spotlight, and The Denver Post.